All photos from Flannery O’Connor papers, Manuscript, Archives, and Rare Book Library (MARBL), Emory University. Emory Photo/Video. 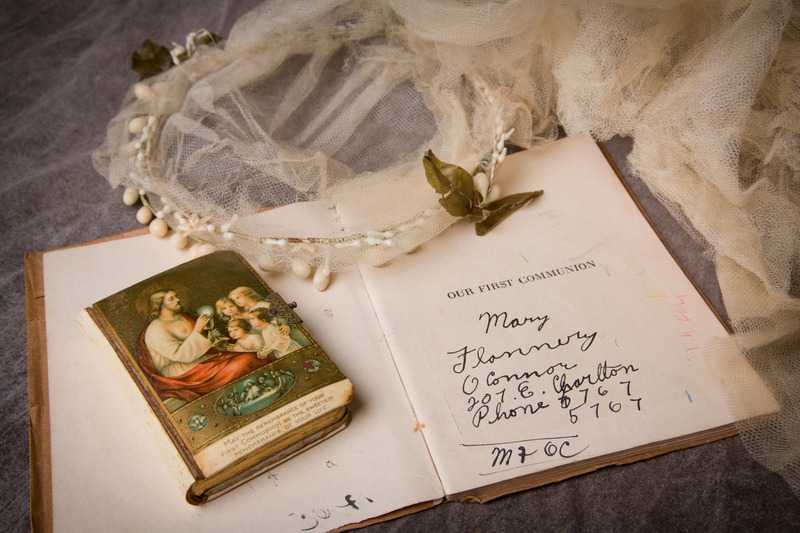 A tour of the new materials recently received from the Mary Flannery O'Connor Charitable Trust. 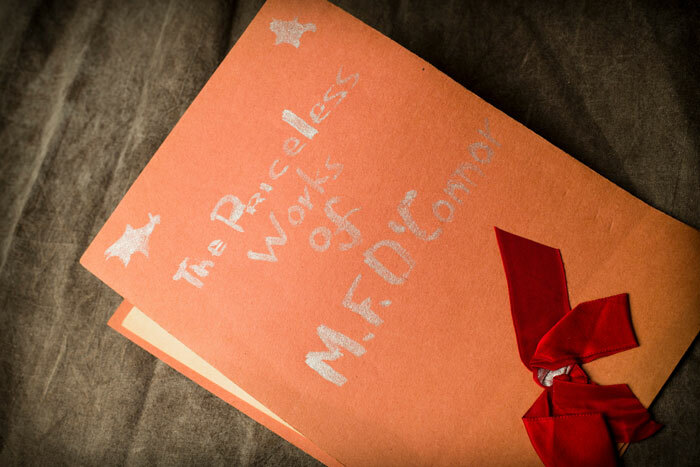 A handmade paper book of poems, proudly titled "The Priceless Works of M.F. O'Connor" in a child's careful print. A rosary and first communion veil. Typed draft pages of the novel "Wise Blood," marked with the author's extensive handwritten corrections. Eyeglasses. Drawings. Linoblocks. Photos. More than 600 letters to her mother alone. 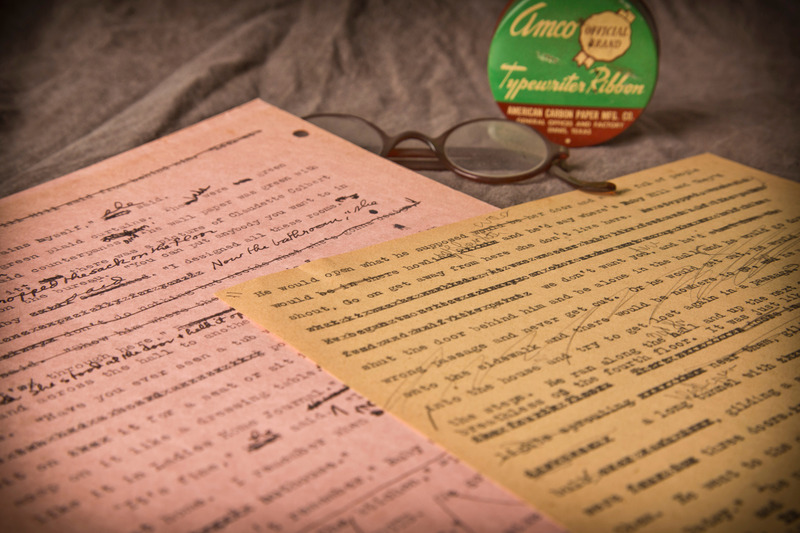 These and many other items will now be available to scholars and students for research purposes as Emory University's Manuscript, Archives and Rare Book Library (MARBL) announced the long-awaited acquisition of the archive of Georgia's own Flannery O'Connor. Known for writing about faith and freaks, ridicule and redemption, O'Connor published two novels and a collection of short stories before her death from lupus at age 39; further works were published posthumously to widespread acclaim, including a National Book Award for fiction. 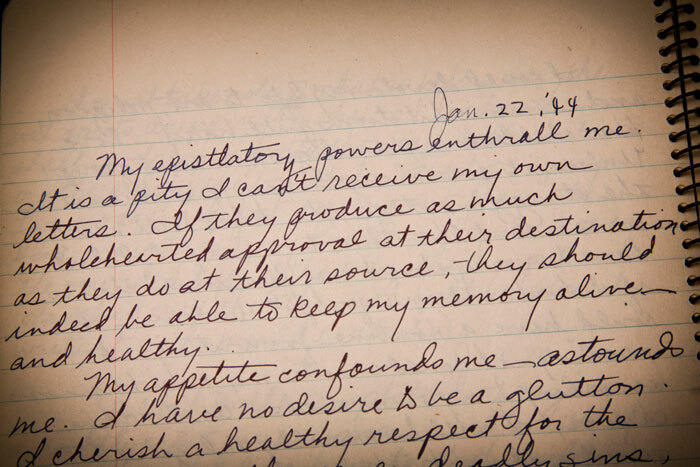 "My epistlatory [sic] powers enthrall me. It is a pity I can't receive my own letters," O'Connor wrote in personal journal in early 1944, among hundreds of documents in the archive. "If they produce as much wholehearted approval at their destination as they do at their source, they should indeed be able to keep my memory alive and healthy." While O'Connor could not receive her own letters, now the world can — and the opportunities they offer to scholars will not only keep her memory alive, but also keep researchers exploring her craft and legacy for years to come. MARBL revealed the acquisition Oct. 7 in an event at the Robert W. Woodruff Library attended by an approving audience of scholars, library supporters, media and a guest of honor who made the acquisition possible — Louise Florencourt, Flannery O'Connor's first cousin and co-trustee of the Mary Flannery O'Connor Charitable Trust, which placed the archive with Emory after years of discussion. "These papers tell the story of a life both modest and bold; regional and now global; prayerful, witty, wondering, satirical, and solemn," said Rosemary Magee, MARBL director, as the collection was unveiled. Magee noted how the newly acquired O'Connor materials are "in conversation" with other writers and artists whose archives are already part of MARBL's extensive collection, including Alice Walker, Salman Rushdie, Benny and Raymond Andrews, and Natasha Trethewey, among others. "No writer speaks more directly to encounters of displaced persons with the grace of convergence than Flannery O'Connor. Thanks to these materials, further profound encounters with mysteries and revelations will be forthcoming," Magee predicted. Kevin Young, curator of literary collections and the Raymond Danowski Poetry Library at MARBL, told the audience about his first experiences reading O'Connor and the depth the archive will bring to future understandings of her work. "What a gift we have here, 50 years after her death, to see the full range of O'Connor's writing, cartooning, religious life and prodigious correspondence … The archive helps us see O'Connor even from an early age as literary and faithful, creative and contentious, fierce and full of praise," Young said. Sarah Harsh, a second year PhD student in English and research assistant at MARBL, spoke of the "amazing opportunity" she had to work with the new O'Connor materials and how such collections offer humanities students the chance to experience "the thrill of discovery" that scholars in the sciences typically find in a lab. "With this new collection, I believe scholars will find O'Connor's work opening up to a number of exciting new directions; certainly, O'Connor's work is rich enough to both sustain the current critical consensus and to support new inquiries," she said. "As O'Connor scholarship moves beyond the regional and the religious, beyond the gothic and the grotesque, this new collection will be an invaluable resource." The unveiling concluded with a champagne toast led by Brenda Bynum, an actress who in 2007 performed a dramatic reading of correspondence between O’Connor and friend Betty Hester when those letters — donated to Emory by Hester in 1987 with the stipulation that they remain sealed for 20 years — were finally made public. "Today we celebrate fittingly the convergence of this remarkable collection from Georgia's finest writer with a noble institution which grew up in the midst of the same land and culture and place that she did," Bynum said. "This is home. So I invite you to raise a toast to the MARBL, to the Mary Flannery O'Connor Charitable Trust and to literature, which shows us all the way home." After raising her glass, Florencourt visited with well-wishers and agreed to a brief interview about the archive, considering questions with a directness befitting one of the first women graduates of Harvard Law School. "I can tell you that I am really thrilled — which tends to be an extravagant word in my vocabulary — that it is now safely in Emory's hands, and I would add to that that my sister Margaret Florencourt Mann and I had hoped for this and it has just been a very long time coming," she said. "My sister died in 2002, but I know that this represents what she would want too." Asked how her cousin would have responded to the fanfare with which her papers are being greeted, Florencourt answered frankly. "Oh, Flannery — it wouldn't be important to Flannery. I mean, she appreciated any honors that were awarded her but she didn't live for them," Florencourt explained. "Some people have to be [praised] all the time, but that was not Flannery. 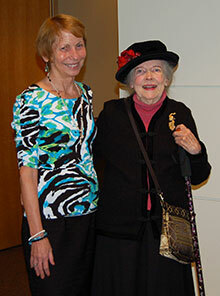 MARBL director Rosemary Magee and Louise Florencourt, Flannery O’Connor’s first cousin and co-trustee of the Mary Flannery O'Connor Charitable Trust, worked together to bring O’Connor’s archive to Emory. Photo by Julie Newton/Emory Libraries. "She wrote because she had to write." Proof of O'Connor's drive to write, even from a very young age, is one of the delights of the archive, according to Magee. "There are a series of items that show the evolution of her own sense of vocation as a writer from a very early age, including handmade books of poetry — some of which are quite elaborate," Magee said in an interview, citing writings dating back to when O'Connor was as young as 8 years old, as well as a later notepad listing stories she sent off for publication to outlets including the New Yorker and The Atlantic, receiving as many rejections as acceptances. "There really is an array of materials that point to her deep sense of conviction to the life of writing as well as a sense of trepidation," Magee says. They also remind readers how much O'Connor was able to accomplish in a career cut short. 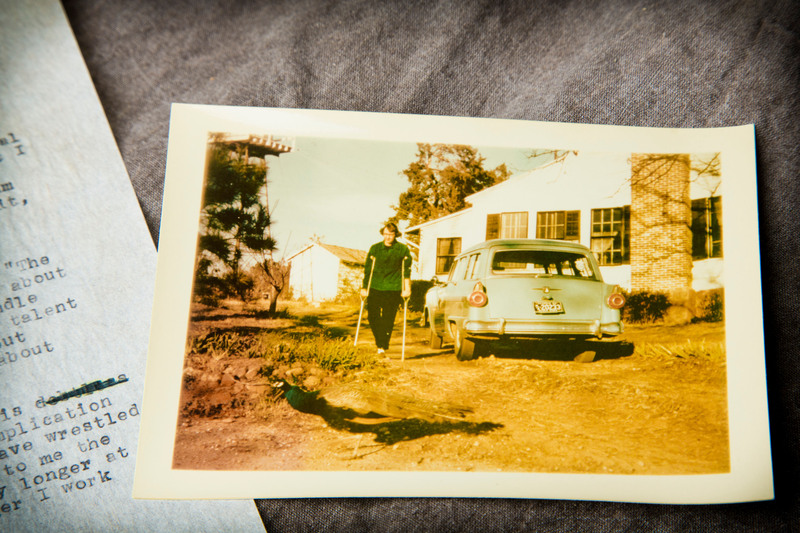 Ill with lupus, O'Connor — who spoke to classes at Emory and whose disease was diagnosed at Emory University Hospital — lived with her mother, Regina Cline O'Connor, at Andalusia, her family's farm in Milledgeville, Georgia, for 13 years until her death in 1964. But while life on a farm in her small town home may give the impression of isolation, the archive also shows how O'Connor's letters linked her to a strong theological and literary community, evidenced by extensive correspondence with family, friends and other writers including Louise Abbot, Cecil Dawkins, Sally and Robert Fitzgerald, Robert Lowell, Caroline Gordon and John Crowe Ransom and Allen Tate. "It's easy to think of her as being isolated due to her diagnosis and illness, and for other reasons," Magee reflected. "She spent a lot of time at Andalusia, and of course that was beneficial to her writing. But these materials confirm what we already knew — what a very avid correspondent she was. A community sprang up around her that was geographically far-reaching, but very intimate as well." The archive's arrival at Emory is also the result of carefully nurtured relationships, culminating connections a half-century in the making. "In July of 1963 I visited you and your daughter to discuss setting up a Flannery O'Connor collection in the Emory University Library . . . 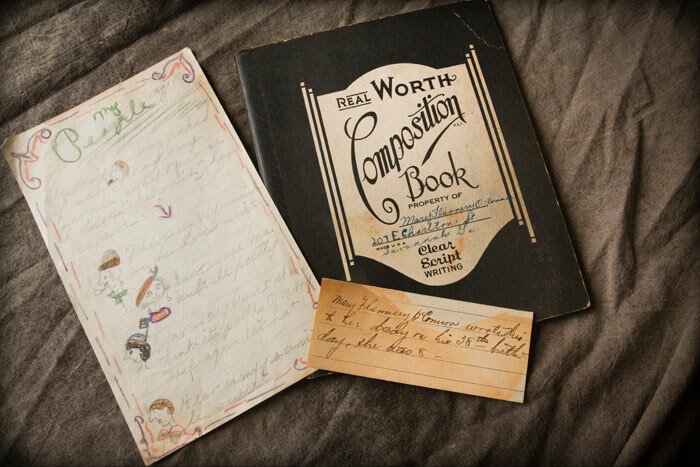 I consider my afternoon with her as one of the high spots of my library career and shall remember it always," David Estes, head of Special Collections at Emory, wrote to O'Connor's mother some 50 years ago. 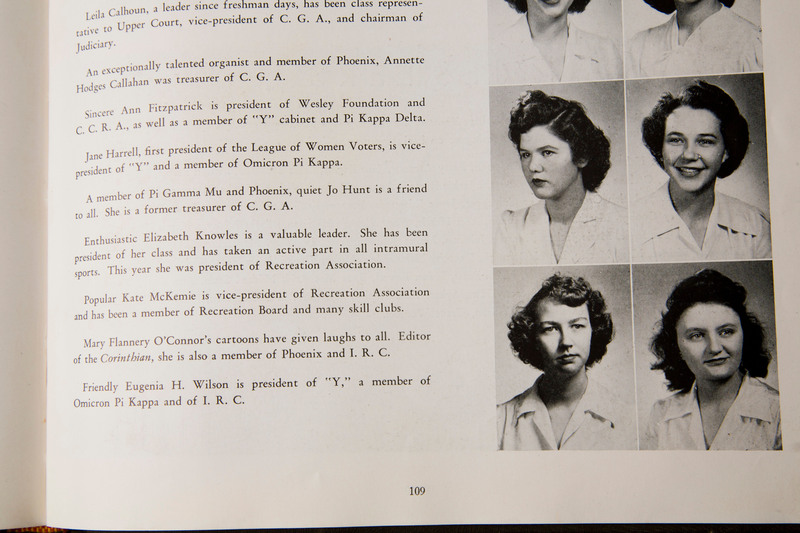 Emory's interest in O'Connor continued over the ensuing decades, Magee recounted, including a 1980 symposium that Magee helped organize as a graduate student. Linda Matthews, who headed Special Collections before serving as vice provost and director of libraries, and former MARBL director Steve Enniss were to further nurture these relationships. In 1987, the university acquired Hester's letters; in 2008, it acquired the papers of Sally Fitzgerald, editor of several volumes of O'Connor's letters and works, adding additional materials this year. 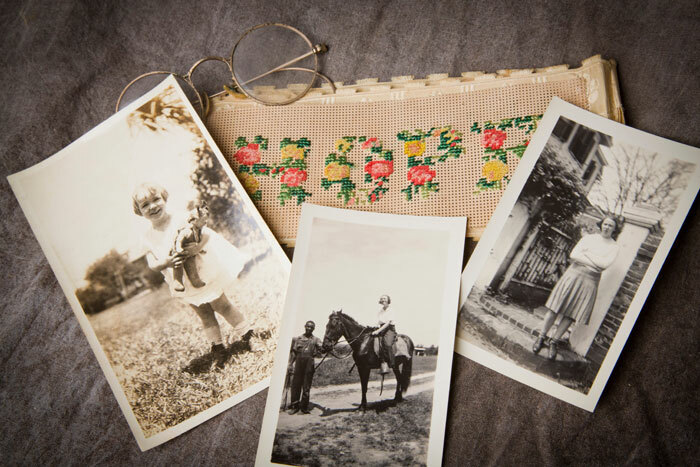 When Magee became director of MARBL two years ago, she sought to reengage conversations to bring O'Connor's own archive to Emory and found Florencourt "very receptive." "We began very close interactions and I would say that the relationship with Louise Florencourt has been one of the most meaningful friendships of my life," Magee said. "This was a personal literary journey that began for me in 1980 as a graduate student here at Emory; thus there is a trajectory from that moment to now, one that offers both connectivity and meaning," she said. The papers are already available for research in the MARBL reading room. "Even though we have only been able to process the archive in a preliminary way, we are going to provide access to it because of the extensive excitement and interest," Magee said.